Package price is based on 12 June departure. Please call us for a list of other sailing dates. Today in Regensburg you have four (!) options for experiencing this medieval gem of a city—select one for the morning and another for the afternoon. Regensburg is a friendly town with quaint cobblestone streets, historic Roman ruins and a UNESCO World Heritage–designated medieval city center. The remnants of Regensburg’s golden age are still on display, particularly in the Stone Bridge, the first bridge to span the Danube, built in the 12th century. Modern Regensburg is a popular center of higher learning, with more than 30,000 students attending its various colleges and universities. Regensburg also frequently appears on lists ranking the world’s best places to live, thanks to its outdoor spaces, historic city center, lively cultural and nightlife scenes, and great shopping. A local expert will show you around and introduce you to some regional delicacies; later, you can stretch your legs with a vineyard hike that includes a wine tasting. Prefer to go for baroque? Visit the 900-year-old Melk Abbey and its extraordinarily opulent library. Sail through the spectacular scenery of the Wachau Valley—one of the most beautiful stretches of river landscape in all of Europe. The 19-mile-long (30-kilometer- long) valley was formed over many centuries by the Danube River, which slowly wore away a rocky gorge in the foothills of the Bohemian Forest between Krems and Melk. Some of Austria’s nest white wines are produced from grapes ripened on the terraces that cling to these rocky slopes, including Grüner Veltliner, which is grown almost exclusively in Austria. Vienna is a cultural treasure trove revered for its art and music. Experience the City of Waltzes with your choice of excursions, as well as VIP access to an extraordinary collection of art—having an opportunity to see these masterpieces in complete privacy is an extra special treat reserved solely for Uniworld guests. And to cap off a perfect Viennese day? An evening concert featuring works by Mozart and Strauss. The grand dame of the Danube, Vienna was the heart of the Austro-Hungarian Empire and remains, to this day, the political and cultural center of Austria. Klimt painted here; Beethoven and Mozart composed here. It’s a treasure trove of splendid architecture, astonishing art collections and inviting cafés—and it’s yours to enjoy. Located on opposite sides of the Danube, Buda and Pest each has its own distinctive character and charm. Made up of two parts—Buda (the hills) and Pest (the flatlands)—and divided by the Danube, Hungary’s capital presents an array of architectural styles that reveal its long and varied history. 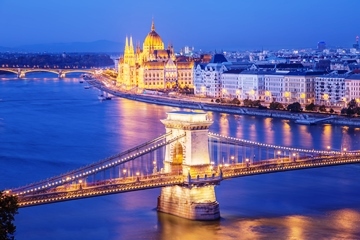 You’ll have two enticing ways to experience the city—a panoramic guided tour aboard a motorcoach, or discover the Budapest that locals love on a special walking tour. Prices listed are per person in Australian Dollars, based on twin occupancy, including all discounts unless otherwise stated. The offer is subject to availability at time of booking and shown on the lowest accommodation category available at the time. Fares are capacity controlled and are subject to change at any time without notice. Prices/Offers are correct as at 01 February 2019 and can be withdrawn without notice. Visas are not included. Airfares are based on business class flights from Sydney and subject to the carriers’ flight schedules and conditions, please call us for prices from other cities. Flight prices are subject to change/increase and surcharges may apply. Payments made by credit card will incur a surcharge.